Fluid Structures are a practice of structural engineers working in conjunction with architects, designers and artists. The practice was established in London in 1999 and has grown steadily since its inception. The project types range enormously and the office has provided input on projects ranging from the design of a single chair to multi million pound commercial developments. The practice was founded with the idea that structural engineering is not simply a subservient discipline that resolves technical issues. We believe that it is a unique discipline where the science of materials and the use of mathematics in analysis can be blended in the realisation of structural forms. Modern technology and computational advancements have allowed us to leave behind the traditional approach of post and beam construction and allow us to consider new forms. We are keen to investigate new ways of putting things together. A wide range of building forms have begun to emerge in the 21st Century. Amongst the many influences, the diversity and sophistication of the natural world is a constant source of inspiration. As an engineering practice we are keen to develop a closer understanding of the natural world, its biology and its ecological systems. We want to avoid interpretations that are two dimensional images or biological cartoons that simply mimic pretty shapes and fluid outlines. We structural engineers are perhaps best equipped to explore the generation of biomorphic forms and investigate their symmetries. "We need to identify a pathway that brings into harmony the spatial and structural considerations and allows them to cross pollinate and create new forms." 1. 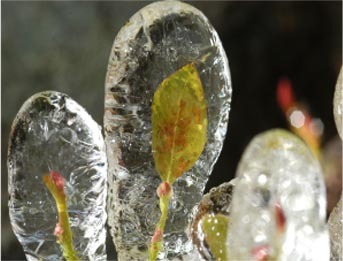 Tony Campbell (Photographer) Ice on Leaf.